When you visit a physical therapist for a problem with pain or movement dysfunction, he or she may use various interventions to help you move better and feel better. These treatments, called therapeutic modalities or physical modalities, are used to augment your PT program to help you regain your normal functional mobility. Physical therapists use a variety of modalities to help treat their patients. There is an array of treatment modalities that can help strengthen, relax, and heal muscles. The ones that your PT chooses to use may vary depending on your specific condition, your needs, and your overall rehab goals. Physical therapists wrap moist hot packs in several layers of towels and place them on the area that needs treatment. The heat provided by the hot packs has several important benefits. It relaxes tight muscles causing tissues to relax. This decreases pain caused by muscle tension or spasms. It also causes vasodilatation of the blood vessels which increases circulation to the area. Patients with muscle strains, spasms, or arthritis often benefit from treatment with moist hot packs. Cold packs are a frozen gel substance used by physical therapists to treat areas of pain and inflammation. The cold packs are wrapped in a wet towel and applied directly to the area in need of treatment. The freezing effects transferred to the patient’s skin, muscle, and tissue has several beneficial effects. The decrease in tissue temperature causes vasoconstriction of the blood vessels in the area. This decreases the inflammation by closing down local blood vessels, restricting blood flow. By decreasing inflammation, pain and swelling can be managed and lessened. Another way your PT may use cryotherapy is with an ice massage. Your PT may keep cups of ice in a freezer. The frozen cup-shaped ice is then massaged over injured tissues to help manage pain and inflammation. Care must be taken; ice massage can damage your skin and tissues if applied too long. one to three minutes is typically recommended for an ice massage. Ultrasound machines are a treatment modality used by physical therapists that utilize high or low-frequency sound waves. These sound waves are transmitted to the surrounding tissue and vasculature. They penetrate the muscles to cause deep tissue/muscle warming. This promotes tissue relaxation and therefore is useful in treating muscle tightness and spasms. The warming effect of the sound waves also cause vessel vasodilatation and increase circulation to the area that assists in healing. The physical therapist can also adjust the frequency on the machine to use waves that will decrease inflammation. 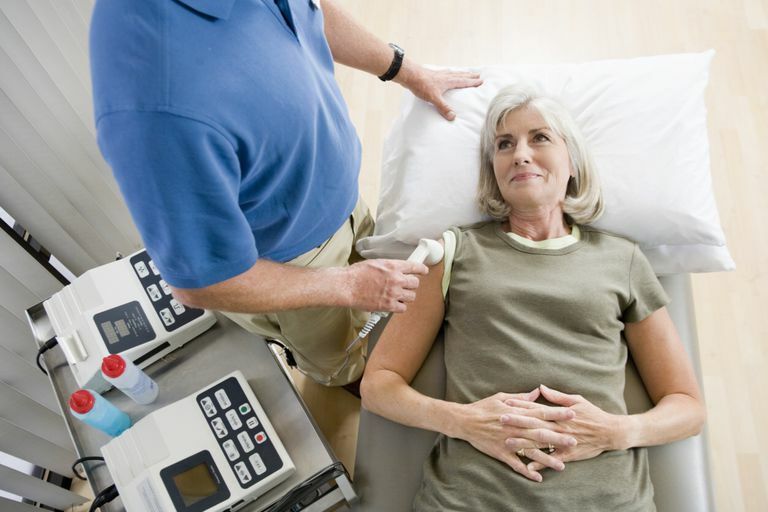 Caution should be used with ultrasound: research indicates that the warming and vasodilation produced by ultrasound do not contribute to the overall improved function of the muscle tissue. Phonophoresis is a cousin of ultrasound. It involves the introduction of medication through your skin and tissues by using ultrasound. During this modality, your PT will use an ultrasound machine, and medicated gel will be placed on your injured body part. Most often, an anti-inflammatory medicine like dexamethasone is used during phonophoresis. A TENS unit stands for transcutaneous electrical nerve stimulation. It is a small battery operated machine that uses an electrical transmission to decrease pain. Electrodes are applied to the affected area. The machine is turned on and an electrical current is sent through the electrodes. A tingling sensation is felt in the underlying skin and muscle. This signal disrupts the pain signal that is being sent from the affected area to the surrounding nerves. By breaking this signal, the patient experiences less pain. Electrical stimulation uses an electrical current to cause a single muscle or a group of muscles to contract. By placing electrodes on the skin in various locations, your physical therapist can recruit the appropriate muscle fibers. Contracting the muscle via electrical stimulation with electrical stimulation called NMES helps improve the contraction of the affected muscle. Your physical therapist can change the current setting to allow for a forceful or gentle muscle contraction. Along with increasing muscle strength, the contraction of the muscle also promotes blood supply to the area that assists in healing. Iontophoresis is another form of electrical stimulation that your PT may use. During iontophoresis, electricity is used to push medication in through your skin to affected muscles, tendons, or ligaments. Typically, iontophoresis is used for anti-inflammatory purposes, although a variety of medication can be used for different conditions. Your injury may require you use an orthotic or prosthetic device to help you move better, and your physical therapist can help you learn how to use it properly. If you have had an amputation, you PT can help you learn to don and doff your prosthetic limb, and he or she can help you learn how to move properly with it. If you have foot drop due to weakness in your anterior tibialis muscle of your ankle, you may benefit from an ankle-foot orthosis (AFO) to help you walk better. Light therapy involves the use of lasers and light emitting diodes to improve healing in injured tissues. Lasers of a specific wavelength are shined into your injured tissues, and it is theorized that this light speeds cellular processes, speeding up the healing of these injured tissues. Kinesiology tape, or K-Tape, is a relatively new treatment in physical therapy and athletic training. Special cloth tape is applied to your body to help decrease pain, improve circulation, or to facilitate muscle function. The tape can be left in place for up to five days to help improve your condition. Caution should be used: K-tape is a new treatment, and it has not been subjected to rigorous scientific research. In fact, a 2017 study found no difference in shoulder pain or throwing motions in patients using kinesiology tape versus a fake application of tape. Although physical therapy modalities can help you feel better and move better, they should never replace an active exercise program for your condition. Most problems that result in functional limitations resolve best with the correct movement strategies and exercises that your PT can prescribe. Aminakak, N, et al. The Effects of Kinesiology Tape on Shoulder Pain and Throwing Kinematics. Athletic Training and Sports Health Care. 2017. 9 (1): 24-32. Boudreault, J., Desmeules, F., Roy, J. S., Dionne, C. E., & Frémont, P. (2016). The Efficacy of Laser Therapy for Rotator Cuff Tendinopathy: A Systematic Review and Meta-Analysis. J Nov Physiother Phys Rehabil 3 (1): 001-015. DOI: 10.17352/2455, 5487(001). Gonzalez-Iglesias, J. et al. "Short-term effects of cervical kinesio taping on pain and cervical range of motion in patients with acute whiplash injury: a randomized, controlled trial." JOSPT 39(7), 2009. 515-521. Takla, M. K. N., & Rezk-Allah, S. S. (2018). Immediate Effects of Simultaneous Application of Transcutaneous Electrical Nerve Stimulation and Ultrasound Phonophoresis on Active Myofascial Trigger Points: A Randomized Controlled Trial. American Journal of Physical Medicine & Rehabilitation, 97(5), 332-338.